Since 1993, BLINDAJES ISBI LTDA. has been manufacturing the highest quality armoring systems for vehicles, helicopters, shields, military personnel carriers, bomb disposal trailers, and turrets. BLINDAJES ISBI LTDA. has been a supplier of materials, such as ballistic steel, glass, ceramic and Twaron para-aramid to other armoring companies. The customers of BLINDAJES ISBI LTDA. can rest assured that its materials have succeeded in all ballistic tests, ensuring that the Company’s armors are 100% effective and capable of protecting their occupants from numerous rifle and IEDs attacks. 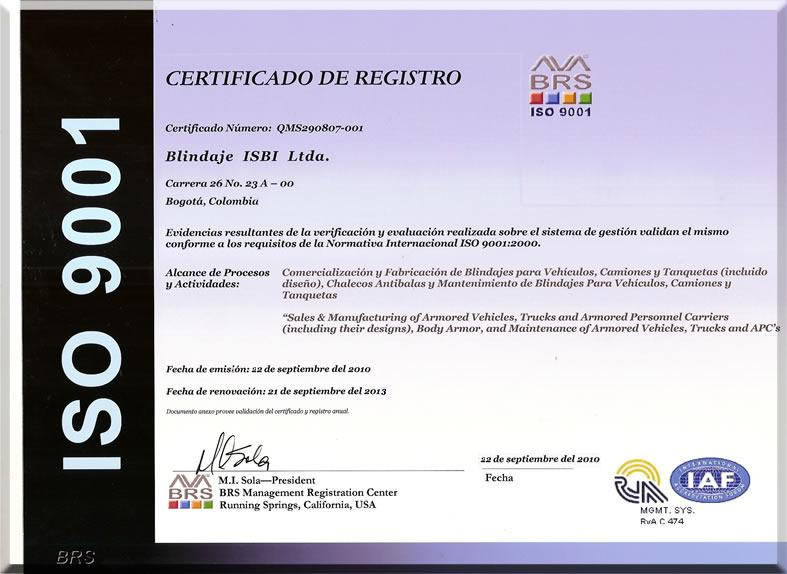 BLINDAJES ISBI LTDA.’s goal is to meet customers’ needs in armoring systems, through proactive quality control and the continuous improvement of personnel competence. The efficiency of its manufacturing facilities is under constant improvement and advancement. 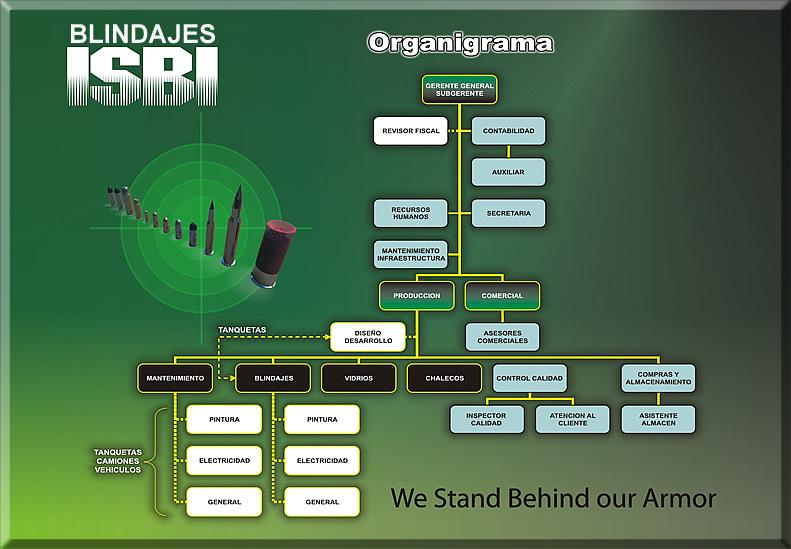 BLINDAJES ISBI LTDA.’s systems efficiency is achieved through the permanent supervision of objectives and indexes, the commitment of its professionals and its adequate infrastructure. INDUMIL’s tests prove that BLINDAJES ISBI LTDA.’s processes add the least weight possible to the vehicle when armored. BLINDAJES ISBI LTDA.’s transparent armoring systems are made of laminated glass for spall protection, air gaps and laminated polycarbonate sheets and the strongest, yet lightest glass available in the market. The Company's patented system uses an air chamber technology that permits passengers to shoot through the glass from the inside of the vehicle (reaction glass). The air chamber allows the interior of the vehicle to be 50% cooler, allowing less heat to be transferred. The Company's Level III armoring system - NIJ IIIA is 18mm thick (3/4 inch) and weighs only 26 kg./m² (5.2 lbs/sq. foot). Similarly, the Level IV armoring system - B6 is 45 mm thick (2 inches) and weighs only 75 kg./m² (15 lbs/sq. foot). The Company uses laminated ceramic with Twaron para-aramid which is a lighter option than steel and provides rifle and light machine gun protection. The pressure of the laminating press is twice as high as the one released in autoclaves, thus the laminate is better and cannot be affected by temperature or humidity. The posts (pillars) and their joints with the roof are armored with steel. The steel is cut with plasma (CNC), in order to achieve a perfect fit and preserve its thermal properties. All armoring systems provided by the Company comply with LEVEL 10 UL 752 international ballistic standards and are capable of stopping up to .50 caliber BMG (Browning Machine Gun) M-33 rounds. Knowledgeable of clients' protection needs, BLINDAJES ISBI LTDA. complies with all international standards. Prior to being placed in the market, all products are certified by the US Testing Laboratory or INDUMIL, which are independent laboratories that test armoring systems at the maximum ammunition speed allowed by the norms (US National Institute of Justice - NIJ, European CEN, UL or Nato Stanag). The Company does not use any offset glass since it is weak and cannot be implemented in sledge hammers and manufactures its own armored glass under a patented air chamber formula. To make sure that there are no ballistic gaps, the Company disassembles the original chassis to insert the ballistic steel. BLINDAJES ISBI LTDA.’s ballistic armoring is made of ballistic steel grade from the U.S. cut by CNC plasma and welded with MIG. The Company mounts the bodies on two types of chassis: F-550 and International Navitrans. Riot Police: Capacity: 14 men + driver + gunner + commander. The Company’s vehicles receive a Level II protection with an upgrade capability for bullets of up to .50 mm. European Norm CEN B6 equivalent to NIJ III. Projectiles fired from calibers 7.62 x 51 Nato (Light Machine Guns, such as M-60 & MAC with M-80 Ball ammo), 7.62 x 39, type AK-47 Kalashnikov and 5.56 Nato (ball, AP, SS109). European Norm CEN B7 equivalent to NIJ IV. Projectiles fired from calibers 7.62 x 51 Nato (Light Machine Guns, such as M-60 & MAC with M-80 Ball ammo), 7.62 x 39 rifles, type AK-47 Kalashnikov and 5.56 Nato (ball, AP, SS109). 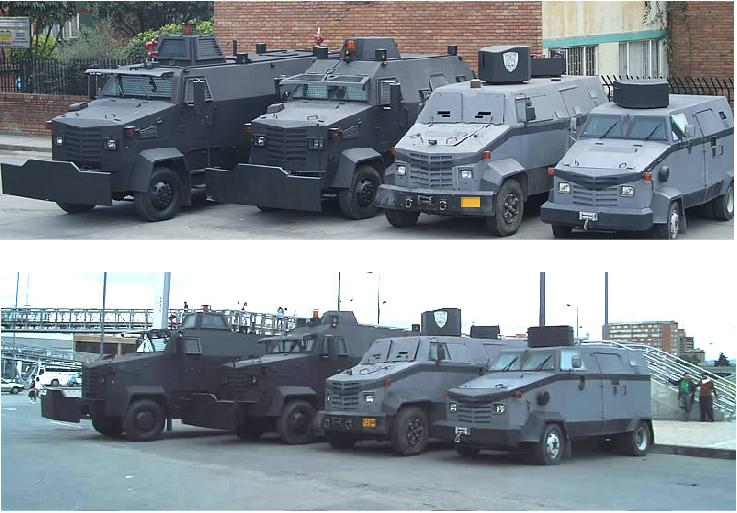 This armored personnel carrier comes with a closed turret mounted on the roof with a free rotation of 360 degrees. The vehicles have the capacity to load from 3 to 8 tons of ammunition or men. BLINDAJES ISBI LTDA. 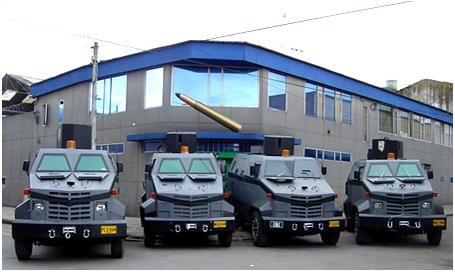 is a leading armoring company that manufactures military vehicles in Colombia. The Company has introduced armoring systems to dozens of gun trucks, APCs, hummers, and planes, using only certified grade steel. .30-06 mm, used in Mauser rifles during the First World War; this round is still common among sharp shooters (snipers) due to its long range and precision. BLINDAJES ISBI LTDA. introduces armoring systems to the floors of helicopters cabins and in some helicopters to pilot seats (the Bell 206) and passengers’ areas (Black Hawk UH-60). For a 7.62mm bullet the armoring system weights 40 kilos per m². Helicopter armoring systems are made of silicon carbide tiles laminated with rubberized Twaron. This option is 20% lighter than that of alumina tiles. BLINDAJES ISBI LTDA. 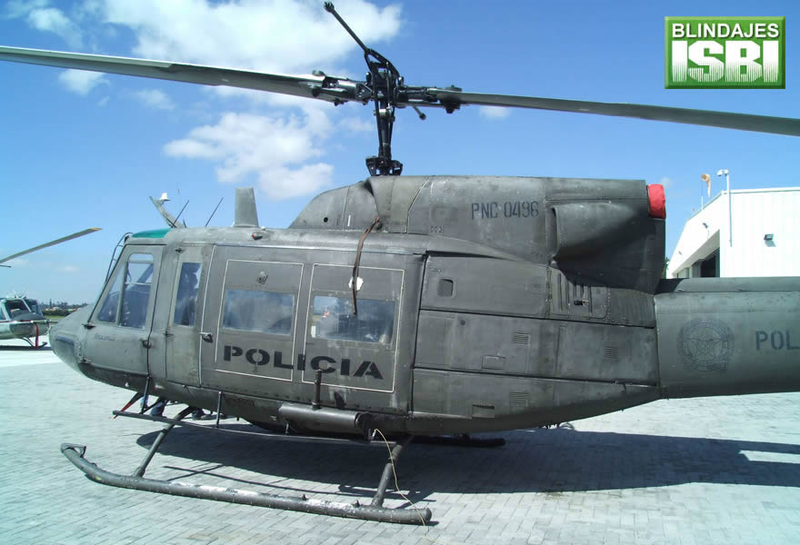 has armored over 20 civilian and military helicopters (American, Russian and French) and has also armored C-130 gunships of the Colombian Air Force. BLINDAJES ISBI LTDA. 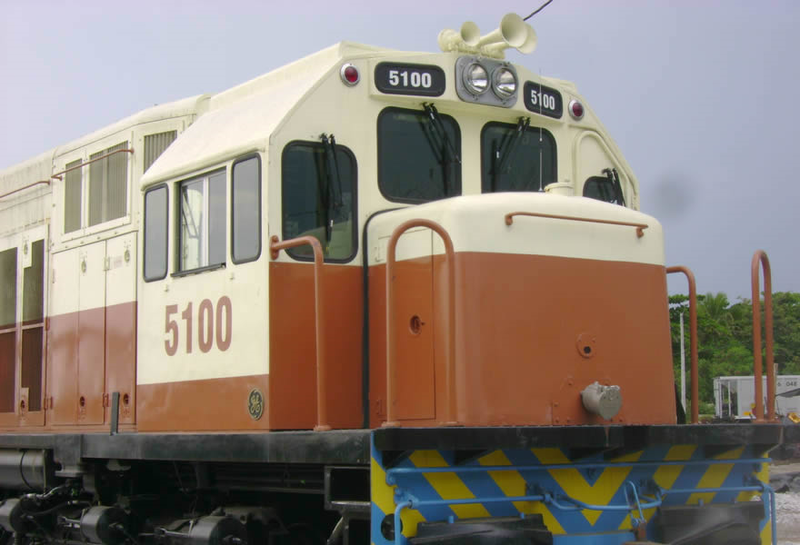 introduces armouring systems from ballistic steel to locomotives. A two inch-thick laminated glass replaces the original manufacturer glass and all processes are certified under ISO 9001. 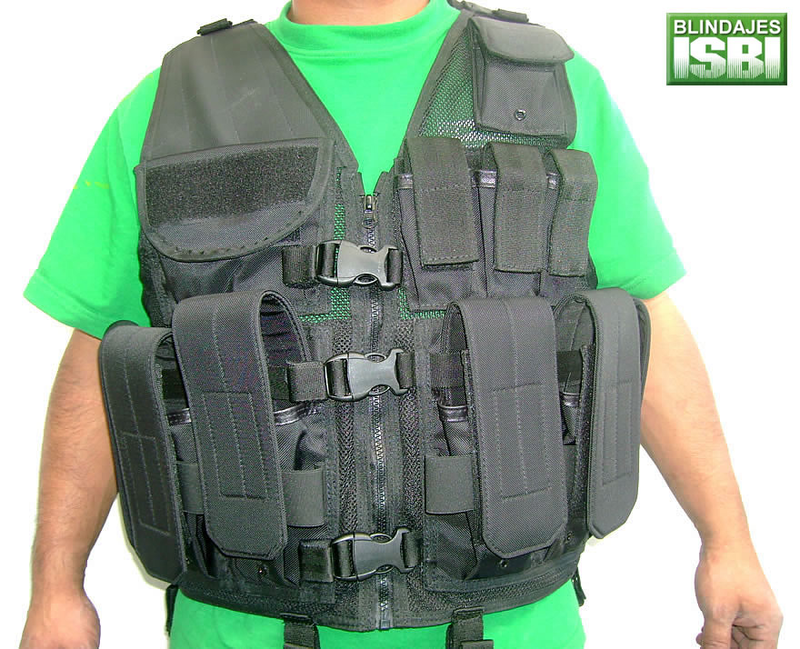 The armoring material of BLINDAJES ISBI LTDA.’s ballistic vests, “Microfilament Twaron”, allows them to be more flexible and comfortable, weighing only 1 lbs./sq. foot, compared to 1.3 lbs./sq. foot of Kevlar 129 and 1.1 lbs./sq. foot of Spectra Shield LCR (intermediate trauma). Its vests are thinner than those made of Spectra or Kevlar. They withstand bacteriological sterilization, since the aramid is not affected by high temperature. The armor panel is covered with transparent vinyl which is electro sealed at a high frequency around the edges, in order to protect the layers of Twaron. Special design for left or right handed people. 5.56 & AK-47 4 lbs. NIJ III 7.62 Ball 5.9 lbs. NIJ IV 7.62 AP 7 lbs. These plates are used in vests Levels II or IIIA and can also be made as stand alone. The attack side is made of 98% aluminum ceramic. The internal side is made of a Twaron or Pet compound. The whole plate is covered with elastomeric polyurethane. BLINDAJES ISBI LTDA. designs and develops ballistic shields made of laminated Twaron fibers that are certified under the U.S. testing laboratory. 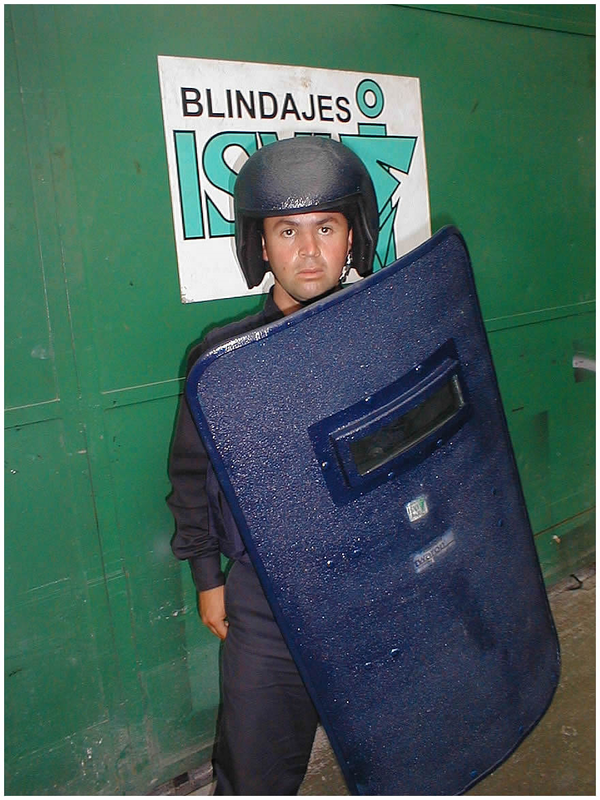 These shields provide a Level IIA ballistic protection. A center handle is attached to the shield. The size of the view port is 4x10 inches. 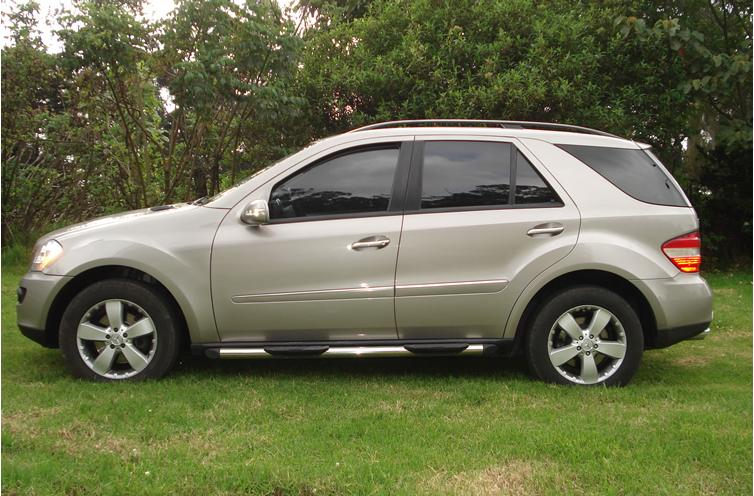 For the Mexican market, the Company offers CEN B5 protection. The shield is covered with elastomeric polyurethane. Level 10 UL 752 .50 BMG - .50 mm Browning Machine Gun. BLINDAJES ISBI LTDA. 's clients range from civilians to government entities, such as DAS, Congress, Indumil, the Army, etc.